Indian Cancer Society (ICS) was established nearly six decades ago under the guidance of the visionaries Dr. Jussawalla and Mr. Naval Tata. ICS, with many firsts to its credit, is a pioneer NGO working on cancer care in India, the others being V Care and Cancer Patients Aids Association (CPAA). Initially started for counseling the cancer patients, ICS moved on to establish series of rehabilitation centres for cancer survivors. Surgery for Cancer may result in functional disabilities such as loss of speech, loss of arm or leg, depression problems due to acute sense of loss; and unemployment issues due to incapability to continue the existing profession. ICS provides services such as therapies, prosthesis, aid and appliances, vocational training, counseling, livelihood assistance, nutritive supplements and medical assistance to help patients overcome the after effects of surgery. UGAM, a voluntary support group of childhood cancer survivors, associated with ICS & Tata Memorial Hospital, is the first NGO foundation working for childhood cancer survivors. ICS has set up mobile cancer detection units equipped with Mammography and X-ray equipment for detection and diagnosis for the poor and needy at a very nominal charge. To ensure reduction in number of patients abandoning treatment, ICS in collaboration with St. Jude’s Child Care Centre has set up 30 dwelling units to provide free accommodation and holistic care (free nutrition, counseling, academic assistance, children workshops, entertainment programs etc.) to the children. ICS believes Cancer is curable, if detected early. This is evident from their newly launched logo I CAN, an expression of self-determination and hope. 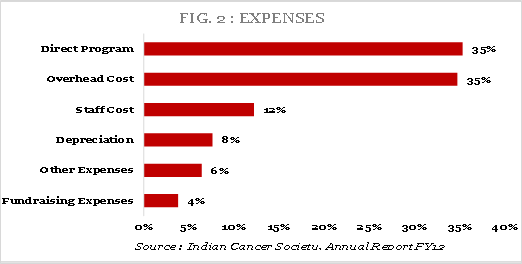 Other expenses have decreased from Rs1.7m in FY11 to Rs150,000 in FY12 as there were no non-recurring expenses in FY12. 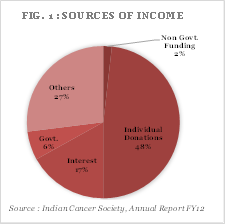 Fundraising expenses have increased to Rs1.5m in FY12 from Rs0.8m in FY11. However, this increase is not backed by proportionate increase in income. ICS appears to self-sufficient in its activities which is indicated by the self-sufficiency ratio of 1.3 (ratio measures how much of expenses can be met from own income – individual donations/corpus income/fee income). However with the loss of its 100% tax benefits, there has been a fall in its income which will be difficult to recoup. No foreign donations are received. ICS has rented out its property to ICS Medical Centre. This ensures steady flow of income in form of rent. ICS receives donations which are specially earmarked for medical treatment. No funds are received for expenses which are not related to medical treatment such as salaries, repair and maintenance of buildings and other administration expenses. Own funds are utilized for non-medical expenses. The Governing Board of ICS comprises of members with experience in medical profession, scientific research, business, legal, finance and public administration. Emphasis is laid on utilizing the donations on programs which bring direct benefits to the society at large, in line with the mission of the ICS.